essence colour n go nail polish in "black is back" with essence effect nail polish in "i love magic"
Some days just need black nails, you know? In this case, black nails were for mourning. Melodramatic mourning over the fact that my molecules were dying in solution when slowly exposed to air (hence the white gunk in the flask in the picture). (Ok, they weren't literally dying, but it's what we say when the molecule starts breaking apart, so.) On the plus side, as long as I did my analyses within a certain time frame, I get really cool results, so yay! That silver lining inspired the ring finger - silver holographic glitter! 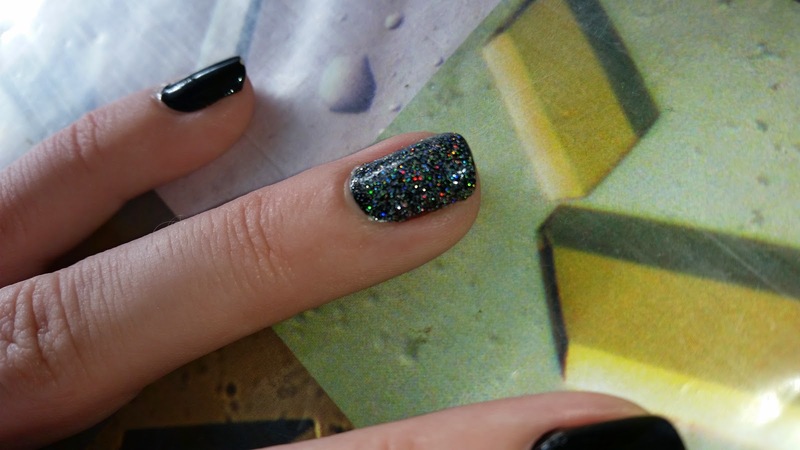 This effect nail polish is packed with super fine holographic glitter and is so fun to stare at! Of course, unfortunately it's difficult to photograph the holographic quality, but hopefully you can get an idea of what it looks like. 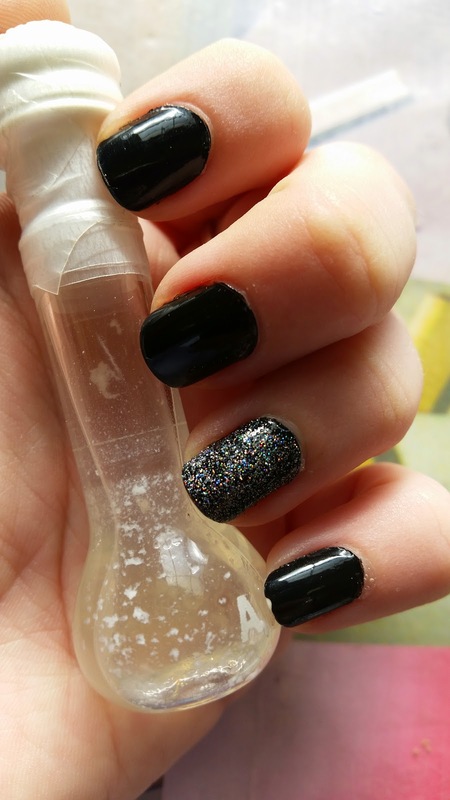 This black polish is gorgeous - opaque in one coat. The only problem is that, unlike most of the other colour n go polishes, it chips super easy. As in, I painted my nails the night before and when I took this photo the next morning, there was already a small chip on my pinkie finger (even with my usual base and top coats). Not cool. Oh well, not all polishes can be perfect.